Today we bring you a guide from Elaine Garley, Animal Communicator. 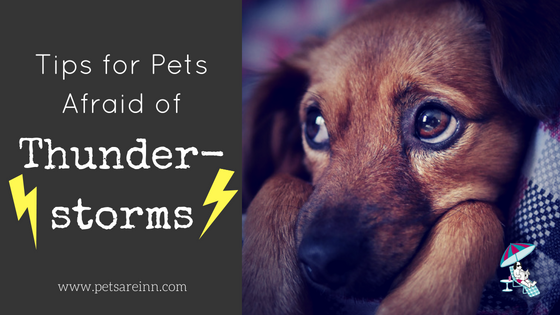 Is your dog afraid of thunderstorms or loud noises? Does he cower under a coffee table? Does she tremble? Now is the perfect time to prepare and help your dog with these frightening experiences. Some cats are afraid of storms or loud noises. Remember your dog or cat will feel the barometric changes hours before you notice the storm clouds. 1. Spend a few minutes with your pet everyday doing the Tellington TTouch® ear slides. Watch the video to learn how to do the ear slides. 2. Ask your dog “where is her safe spot.” Find a place your dog feels comfortable away from windows. Often the bathroom is good spot because of the cool floor and the grounding provided by the water pipes. Sit with your dog in this room or a room she picks. 3. Purchase Bach® Rescue Pet (glycerin base) or Rescue® Remedy (alcohol base) to have on hand. It is a flower essence that helps calm people and pets available at health food stores and pet supply stores. Follow the directions on the box. On a day predicted to have storms, add 4 drops of Rescue Remedy to his water, a porous treat, or rub onto her ears. Repeat as needed. 4. Purchase a Thundershirt® (a great tool for frightened pets – cats included) from local pet supply stores. Initially use the Thundershirt on beautiful sunny days or non-storm days. Then use it on days when storms are predicted. You can leave your dog alone with the Thundershirt on. If it is really hot in your home, you may want to wet the shirt to keep him cool. 5. You must relax and be calm for your dog. Exhale and be conscious of your breathing. Play some soft music if it helps you. Speak in a low, calm voice. 6. Give Rescue® Remedy to everyone – people included. 7. Picture your dog relaxed, sleeping, or resting near you. It is amazing how changing your mind will change your pet’s behavior. 8. Go with your dog to his safe place. 9. Do ear slides on her and enjoy the time together. Over the years b were calmed during thunderstorms and loud noises including fireworks using these techniques. In 2007, I remember how quickly Chief, a lab/husky changed from a calm dog to one crouched under a coffee table due to a severe thunderstorm. Within a very short time of using TTouch® on him, Chief came out of hiding and took treats. A few summers ago, I taught a client how to help her terrified mini-doxie, Andy, with thunderstorms. Andy was so relaxed that night he slept through the storms as Dana watched him! Still need help for your dog with thunderstorms? Schedule a free 15-minute phone consultation.